The Israeli government has repeatedly announced plans to forge ahead with plans to expand settlements in the occupied West Bank in direct opposition to President Barack Obama’s demand for an absolute settlement freeze. On May 27, Secretary of State Hillary Clinton leveled strong criticism at Israeli policy, telling reporters that President Barack Obama “wants to see a stop to settlements – not some settlements, not outposts, not ‘natural growth’ exceptions.” Israeli government spokesman Mark Regev responded by declaring that “normal life” in the settlements would continue, using a phrase that is code for continued construction. With neither side exhibiting willingness to back down, the stage is set for a contentious clash between Israel and the U.S. over settlement policy. At the center of the maelstrom is Israeli Prime Minister Benjamin Netanyahu, leader of the hawkish Likud Party, who has highlighted his unique understanding of the United States – he is Yale educated and speaks flawless English. Supporters of the settlement movement are an integral part of his governing coalition. How Netanyahu navigates between his far-right constituency and increasingly insistent demands from Obama will not only determine the fate of his government, but also the fate of Israel’s “special relationship” with Washington. 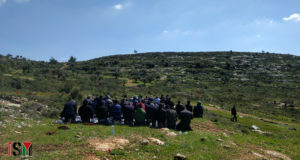 A gathering of the settlement movement’s leading figures in Jerusalem on May 22, documented in this exclusive Mondoweiss report, revealed the unprecedented influence of the settlers on Israeli policy. The event, a ceremony for the presentation of the Moskowitz Foundation Prize for Zionism, was organized and bankrolled by one of Netanyahu’s closest confidants and backers, the American casino tycoon Irving Moskowitz. For over a decade, Moskowitz has funneled millions in profits from his California-based Hawaiian Gardens casino, where he has been sued for exploiting undocumented workers, into settlement construction projects in the West Bank, including Palestinian neighborhoods in East Jerusalem. He has also funded several neoconservative think tanks including a research center named after Netanyahu’s brother, Yonatan, who was killed while leading the Entebbe rescue raid in 1976. Moskowitz and Netanyahu have remained close since he established the center. In 1996, Moskowitz convinced Netanyahu, in his first round as prime minister, to open a tunnel adjacent to the Temple Mount, a controversial act that led to several days of rioting and 70 deaths. Four years later, Prime Minister Ariel Sharon’s provocative visit to the tunnel set off the so-called Al-Aqsa uprising, the opening salvo of the Second Intifada. Now, Moskowitz’s imprint on the West Bank’s landscape is most clearly reflected in the expansion of the settlement called Kiryat Arba, a hotbed of Orthodox Jewish radicalism located high above the occupied city of Hebron. Despite the fanaticism of Arnon and his followers, who routinely rampage through Hebron, vandalizing Palestinian homes and attacking local residents (often under the watch of the Israeli army), they are not isolated as a rogue element in Netanyahu’s political world. Indeed, several of notables stood on stage to present Arnon with his prize. They included Professor Moshe Aumann, who won the Nobel Prize in 2005 for his work on understanding conflict through game theory, and Uzi Landau, the Israeli Minister of National Infrastructure. (Landau’s party, Yisrael Beiteynu, has introduced bills that would compel Arab citizens of Israel to take loyalty oaths and which would criminalize open discussion of what the Palestinians call “Nakbah,” or “catastrophe” of Israel’s founding). Also in attendance was Benny Begin, a leading Likud member of Knesset and the son of the late Prime Minister Menachem Begin, the first Likud prime minister. On May 25, Ta’ayush member Joseph Dana detailed to me the continued development of Hilltop 26. Since I visited the outpost, Kiryat Arba settlers had wired it with electricity and established a security perimeter. 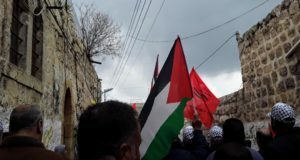 Two days before, Dana and two other Ta’ayush activists were arrested by Israeli army officers for returning to the area to document conditions and not leaving rapidly enough. 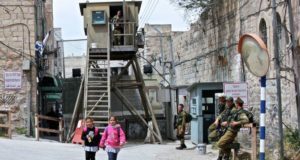 After interrogating the activists in Kiryat Arba police stations – “Why are you always creating chaos here?” Dana said the army commander angrily asked him – the commander ignored two calls from left-wing members of Knesset for the activists’ immediate release. In the end, Dana and his colleagues were released under the condition that they not return to the West Bank for two months. Two days after I listened to Dana’s story, he called me with unexpected news: the army had dismantled Hilltop 26. Netanyahu had issued a list of 26 illegal outposts he planned to demolish — an unsuccessful tactic to mollify the Obama administration — but Hilltop 26 was not among them. Dana attributed the sudden demolition to intense coverage of the controversy, particularly my video for the Daily Beast and an editorial he authored for the Israeli daily Ha’aretz. “It seems like the government was so embarrassed by all the media coverage, and even though they tried to prevent us from even going to Hilltop 26 to document what was happening there, they decided they had to take action,” Dana told me. The demolition, however, has sparked a furious backlash from the fanatics of Kiryat Arba. According to Dana, the settlers have initiated a new round of violence inside Hebron – already, an elderly Palestinian man has been beaten. And while the settlers hatched plans to rebuild the outpost, the following call for retribution appeared on a Kiryat Arba web forum: “The destruction of outposts and their surrender is the first step in the bigger scheme… we will not be silent any longer! We will not silently abided by false declarations, promises and temptations… Bribes blind the eyes of the righteous. We will stop the cleansing at the source.” The battle over Hilltop 26 appears to be just beginning. So does the struggle between Obama and Netanyahu.